Joseph Mallozzi's Weblog: August 22, 2011: If the karoshi doesn’t kill me, the deep-fried fudge might! August 22, 2011: If the karoshi doesn’t kill me, the deep-fried fudge might! “Have a good day. Don’t karoshi!” – Akemi, Every morning before I leave for work. Hmmmm. I suspect that, in her subtle way, Akemi is trying to tell me something. But what? WHAT?!! Speaking of work – prep continues on my block (episodes #103 and #106, Sharks and Payback) as we try to cast, nail down locations, and get through that final round of meetings in advance of next Monday’s start of production. Also, have my hands full with these seemingly endless script revisions. This morning, I received a call from one of the broadcasters informing me that the script for episode #103 was in great shape! And that I could expect the next round of notes by day’s end. Anyway, the production express stops for no one. I’m on board and racing toward the finish line – now December 2nd. I’m sure that by that point, we’ll have a thoroughly awesome first season under our collective belts and will have established a well-oiled machine for the second season’s team (And, yes, I have no doubt that there WILL be a second season). Following Christmas in Montreal with mom and sis, I’ll be headed back to Vancouver for a much more easy-going 2012. Hopefully, Akemi will be along for the return trip. To all of you inquiring about Akemi’s future here in Canada – well, I’ve retained the services of an immigration lawyer to help us out. With less than three months and counting before Akemi’s visa expires, here’s hoping we can figure something out. I know that Carl would miss her terribly. Tonight, we start by filling out oodles of paperwork! A Weird Food Purchase of the Day video installment. Deep-fried chocolate fudge! Previous Article August 21, 2011: Daredevil Eats at the CNE! The Return of the Weird Food Purchase of the Day! Next Article August 23, 2011: Lou and Hugo together at last! Doggy R&R! The Weird Food Purchase of the Day: Deep-Fried Jos Louis!! Oh Joe, watching that video just makes me pity your poor arteries. How much of a workout will it take to erase that day’s indulgences? Great to hear that you have an expert working on Akemi’s visa issues. I’m really hoping that everything works out well there. Hey, Joe, thanks for that mailbag you teased us with last night! My chest feels tight just watching that video. Then again, fried dought is an Italian staple, so I guess I shouldn’t talk. Okay I am so so so so happy to hear Akemi may be staying. She’s good for you and more important, good for us. That said, your eating partners are wimps. For crying out loud, they have no sense of adventure (or an abundance of sense of self preservation). If you married Akemi could she stay? Good luck with the lawyer! There are so many criminals, immigration should focus on the scumbags and let the good ones stay. Akemi should do well in interviews with immigration. She is so cute, how could they resist? “Karōshi”? You really need to set up that twitter account. It was a stroke of genius. So were you very sick post fair food? Why ruin fudge deep frying it? It’s so good on its own. Thanks for the Akemi update. I was curious but didn’t want to be a bud-in-ski. Don’t need to fill me in on the particulars, but glad to know you are working on a resolution. I know that when living in a SE Asian country there was a continual retreat for Ferong (foreigners of European genealogy) to the boarder to renew their VISA. Hope for the best. You know how Asian women have a circuitous way of telling you something. 2. I love Akemi’s “don’t Karōshi” comment. 3. 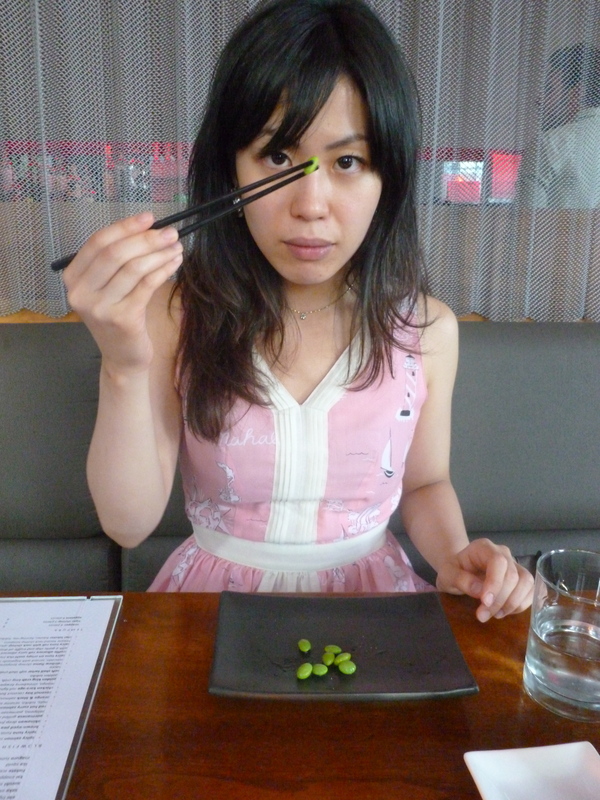 I love Akemi’s dress with the little sailboats in the picture where she’s eating edamame. She looks adorable, and very determined! 4. Good luck on getting Akemi’s continued stay in Canada approved. That fudge may have been tasty, but it certainly looked rude. Must have been by the bathroom for some reason. You worry so little about your health. That’s gotta’ be less stress. AAAAARRRRGGGHHH!! None of your videos are showing up for me! I can hear them, just can’t see them. Not at home, not at work. I am very, very sad. Also, that blog entry above sure as hell doesn’t look anything like a mailbag to me. Take care of yourself, sir…I totally get the job stress thing. But look on the bright side – at least you’re not working for family. Are you or are you not going to be executive producing for Transporter: the Series in Toronto next year? Will you be writing scripts from Vancouver and flying into Toronto now and then, like Carl has so far? Or will you be leaving Transporter completely and working on another project, to be determined? i’m in awe of akemi’s chopstick skills. she looks very intense in that picture. must be concentrating not to loose her grip on that edamame. i agree with this entry title. So glad to hear y’all are working with an immigration attorney. As a former US gov’t. immigration employee, I would have recommended that move. I’m sure the lawyer can think of something. I think Akemi chan is pretty much a Canadian mascot now, if nothing else, so she simply can’t go. Akemi chan, 私たちはあなたを手放すことになります!!!! I know I totally missed it, Joe, but when did you actually make the decision (get the okay?) to move back to Vancouver at year end? Anyone point me in the direction of the blog post of note? Thanks in advance! Oh…I sure hope that Akemi is able to stay. Y’know…Joe…I think it’s time you did something about it. (*wink wink* *nudge nudge*) I think it’s time you show her how much you really love her. Pop the question already. Are you actually quitting Transporter or just trying to scare the suits into leaving you the f**k alone? I hope it’s not the German network giving you notes. Remember they produced “Sumuru”, which just about ended Michael Shanks’s career. Not really, but let’s just say he often apologizes to anyone who ever watched it. Akemi is awesome and I’m glad you’re fighting for her! Glad to see your attending to Akemi’s dilemma. Hope all works out well for her. That gave me heartburn just watching it. Good luck to Akemi. Hope things come to a swift resolution and she can stay in Canada. Musical doodle……. brutal…… futile…… ARGGHHHHHH WHYYY???????????? I suggest you have Frank Cassini and his brother John as two evil Italians in your series. They’ve never actually worked together in a scene. Can you believe that? I’m sure you could find a cozy spot for them. Also, how on earth can you eat all that stuff from the CNE? Those meals were heart attack on a plate. I’m so jealous! Well, Carl is not the only one who would miss Akemi. WE, your and Akemi’s loyal followers, would miss her too! And, don’t forget you have 4 other family members who would miss her. So, when are you getting the “Akemi’s words for the day.” or “Akemi’s words to live by” Twitter account going? Speaking of other family members, how are Max and Jelly? ok..will behave and stop bugging you. So can some one tell me what player i need to down load to watch the videos? they use to play for me and now they won’t… I can watch youtube video’s so why can’t i watch these? thanks for the help.